Today, Readdle Inc., the leading productivity and business software developer for iOS and Mac, is proud to announce a major update for Spark, bringing the best in class custom integrations with 11 popular productivity services: Reminders, Things, 2Do, OmniFocus, Wunderlist, Todoist, Trello, Asana, Evernote, OneNote, and Bear. With dozens of emails we receive daily, we keep losing important ones in between newsletters and mile long discussion threads. Details for specific tasks get lost. All of it slows us and our teams down. There is a complete disconnect between our inboxes and the task management tools we use. Not anymore. • It takes seconds to export any email from Spark to your go-to productivity app. • You can choose between different export formats for each service. • Return to the context of an email by clicking on a unique link to open that email in Spark. • The export window is customized to match the style of each service that you use. The integration is available for the Mac version of Spark, but it’s coming to the iOS shortly too. This is one more step to building the “future of work” ecosystem of apps and services, providing you with the best full-circle experience. 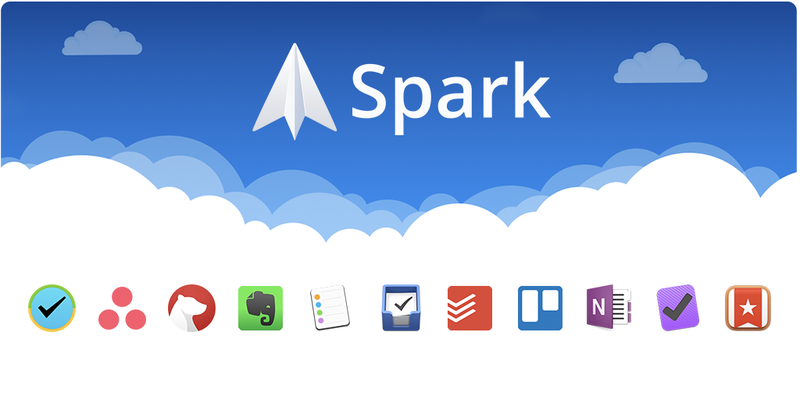 Get Spark with all the third party integrations now at the Mac App Store!